Skipper Ben Pope's hat-trick sealed a first win in 23 attempts for Worthing this evening. Picture by Stephen Goodger. Skipper Ben Pope hit a hat-trick as Worthing Football Club bagged a first competitive win since March at Woodside Road this evening. As well as Pope's treble, Kieron Pamment struck twice to seal an emphatic 5-0 Sussex Senior Cup second-round success over two-divisions below Southern Combination League Premier Division rivals Lancing. Worthing, who were without a win in 210 days and 22 competitive matches - a run which stretched back to March - finally sealed victory. 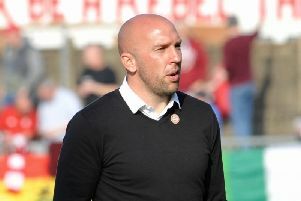 The success is the only one Worthing have recorded in all competitions this campaign and the first from seven matches in charge for manager Adam Hinshelwood in his second stint at the club. Darren Budd and Joel Colbran were both handed debuts as Worthing made six changes from the team that suffered a home Bostik League Premier Division defeat at the hands of league leaders Hendon. Lancing - coming in to it on the back of five successive wins in all competitions - made two changes from the side that sealed a Peter Bentley Cup quarter-final spot by beating Arundel on Saturday. Lewis Broughton and Alex Fair made way for Elliott Finney and David Marsh. The game got off to a sedate start but Kieron Pamment looked a threat. The Worthing frontman went on a superb solo run, which saw him race clear after 12 minutes, but he fired straight at Lancing goalkeeper Tyler D'Cruz. Worthing looking shaky at the back, nearly gifting two-divisions below Lancers the lead inside the opening half-hour. After midfielder Rhyle Ovenden gave the ball away, Leon Dramis cut in on his left-foot but shot sailed well over. Debutant Budd played an influential part as Worthing went ahead on 30 minutes. The midfield man, who signed from Horsham last week, sent returning Ben Pope clear, who cleverly poked past the onrushing D'Cruz. Lancers responded well after going a goal down and should have levelled three minutes later. Bradley Donaldson's pass was dummied by Lucas Tredrea, forward Lewis Finney took it in his stride but flashed a shot inches wide of the far post. That miss would come back to haunt Lancing as Worthing doubled their lead five minutes before the break. A sweeping move saw Rhyle Ovenden send Lucas Wrightman clear, his cross picked out Pope and he volleyed home his second. Worthing were then well on course for a first win at the 23rd attempt seven minutes after the restart. Sam Rents' pass sent Pamment clear, he then cut back in and curled past D'Cruz. Skipper Pope then completed his hat-trick on the hour. Parsons' fierce drive was handled in the area by David Marsh, with referee Dan Austin pointing to the spot. Pope took the ball, slamming the spot-kick down the middle to complete his treble. Substitute Ross Edwards superb through pass picked out Pamment, who fired home his second eight minutes from the end. WORTHING: Covolan; Colbran, Young, Rents; Wrightman, Budd, Ovenden, Schneider; Parsons, Pamment; Pope. Subs: Sparks (Pope, 65), Edwards (Ovenden, 75), Watson, Boiling, Williamson. LANCING: D'Cruz; Donaldson, Marsh, Sharman, Clayman; Dramis, Spinks, E.Finney, Williamson, L.Finney; Tredrea. Subs: Pittock (Sharman, 66), Sisimayi (E.Finney, 63), Watson (Williamson, 75).